Flash back to the fall of 1991. The economy is jarred by the savings and loan crisis, and officially exited a recession in March of that year, but economic growth was still weak. Into this environment, two twenty-somethings started a direct mail advertising publication with an idea to be different and better. The concept was a publication that provided the delivery reliability and circulation guarantee of direct mail, in combination with the lower printing costs provided by using newsprint. To help both consumers and small businesses, the new publication would offer coupon advertising. Local merchants could generate more business, and recession conscious consumers could save money while buying the goods and services that they wanted. The mission was to provide local merchants with a quantifiable return on their advertising investment. The ads would be sharp, the offers good, and the publication would feature advertising from a diverse base of merchants so that there would be something inside for everyone to save money on. Many people didn’t think these two young men had a chance. They were frequently advised to go out and get “real” jobs. Twenty-five years later, Richard Pease and Brian Mikol are proud that Spectrum Monthly has grown from reaching 10,000 homes in the Bedford, NH area, to being the state’s largest monthly direct mail advertising publication with a circulation in New Hampshire and Massachusetts that tops 300,000 homes each month. Hundreds of loyal advertisers still provide savings opportunities to the thousands of Spectrum readers who have come to rely on the publication for shopping and dining savings. Over the years, format changes have seen the page size increase, and now every page is printed in full color. The distribution is still reliably handled by the U.S. Postal Service. Spectrum is thankful to the many, many businesses who advertise on a regular basis, month after month, into one or all of the 27 zones that the publication currently covers. The business that started as a direct mail advertising publication has grown and evolved during those 25 years. The great response enjoyed by Spectrum’s advertisers allowed the company to expand into the solo direct mail business. To do this, a small printing company was acquired, followed by a mail house. Steady growth resulted and the range of printing equipment continued to expand. Several years ago the company diversified to include a wide-format signage division. In 2002 the company moved to its present location at 95 Eddy Road, located in a mill building on Manchester’s West Side. Starting with one part of one floor, the company now occupies more than 70,000 square feet for its more than 200 employees. The company’s founders were honored as the Small Businessmen of the Year in 2008 by the US Small Businesses Administration. With a deep commitment to the local community, Spectrum Marketing Companies is pleased to be able to donate to and support very many local non-profit causes, such as New Horizons, the Granite YMCA, The Plus Company, Hope for NH, Easter Seals, the Salvation Army, and many others. 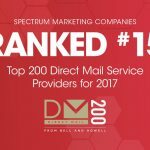 In addition to the Spectrum Monthly publication, Spectrum Marketing offers its clients agency level design services, commercial printing, direct mail, signage and logistics services.